Last week when my sister-in-law Jessica was here to help, she cooked dinner for us every night. We kept telling her she was working too hard, but she just ignored us and kept slaving away. One night she even made homemade onion strings (recipe from The Pioneer Woman) that were TO DIE FOR. Sadly, when I went to photograph them, I discovered that my 50 mm f/1.4 lens was broken. (Side note: this was a horrifying discovery. Amazingly, when I took it to the camera store, I was within ONE DAY of the manufacturer’s warranty. It was a Halloween miracle!) Back to food…even though there’s no photo, you can be sure that Jessica’s onion strings were amazing and beautiful. And beyond tasty. Another night Jess made teriyaki chicken for us in the crock pot. She got the recipe from her friend Carol who has seven kids and does an amazing job of making food that kids will eat and like, as well as adults. This teriyaki chicken was no exception! We loved it! And it was super easy to throw together, so I’m definitely adding this to the repertoire. Place chicken in crock pot. Mix all other ingredients together then pour over top of chicken. Cook on low eight hours. (Jane note: I think Jess cooked it for about half that time at high since we started cooking later in the day.) Once chicken is cooked, shred with two forks and mix with sauce. 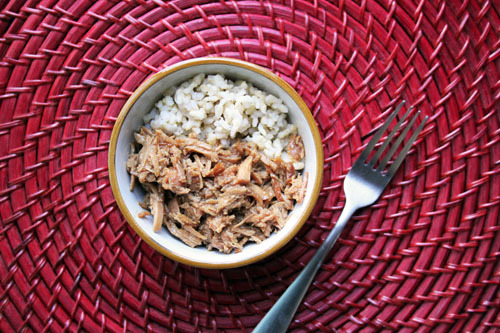 Sauce will seem too thin, but once the chicken is shredded and mixed in it will be perfect. Carol’s notes: I usually double the sauce and just put in some boneless, skinless chicken breasts. My kids only want this recipe for Teriyaki Chicken now. I also substitute – rice vinegar and some of our canned white grape juice and don’t add the oil. Thank you! I need more easy crock pot recipes and I was just thinking about making teriyaki! #1: In Carol’s notes she says “I also substitute – rice vinegar and some of our canned white grape juice”, but does she mean INSTEAD of the Red Wine Vinegar she puts in Rice Vinegar and white grape juice combined as the substitute? #2: She said she doesn’t put the oil, but what roll does the oil play in the dish? Is it important? Would it be any different if I didn’t add the oil (even though you’re supposed to)? Hi! I’m Carol. It has been so fun for me to see this recipe posted here. I just wanted to answer question #1 from Amy since it isn’t very clear in my notes. I put in the rice vinegar and my home canned white grape juice INSTEAD of the Red Wine Vinegar. I just do about 3/4 Tablespoon of each. I usually don’t have Red Wine Vinegar around so I just use what I have instead. Since I’m not an expert cook, I’ll leave question #2 to someone that knows. I just don’t put the oil in because I’m trying to minimize my fat intake. Enjoy! Yeah! Thanks! This is on my menu for Saturday (11/19) so we’ll see how it goes!!! I can’t wait! Do you think there is enough liquid to also cook some veggies in the sauce or would you double (or triple) the sauce to add veggies? I just emailed jess to find out what proportions she cooked, then I will be better able to answer the question…so stay tuned and I’ll let you know! 🙂 the liquid would definitely be yummy on veggies, so this is worth digging to get an answer for! jess answered your question below (#5)…but when she made it she doubled the sauce with 3 large chicken breasts…and there was enough sauce for the chicken, so you would definitely want to do more sauce at those ratios. hope our answers are helpful! Yum – the vegetables are a fab idea. I would say triple the sauce if adding vegetables. I like the chicken to have sauce swishing and flowing around in the bottom of the serving dish if possible for people to spoon on as much as they want esp. on their rice. Carol? What do you think? I used to serve this with vegetables in it also. I would just stir-fry the vegetables and then throw them into the Teriyaki chicken when it was ready to serve. I try to get vegetables in as often as possible. Unfortunately, my children would complain and pick out all the vegetables anyway. So now when I do vegetables with it, I just serve them on the side for those that want them. Some battles I just can’t win. If I were going to add the vegetables in with the chicken, I would triple the sauce. I think that’s what I did in “the vegetable Teriyaki chicken days.” Good luck! I made this for dinner tonight and it was delicious. I made a side dish of stir fry veggies with it and mini egg rolls (from Costco). What a great recipe! Thanks! just one question, i know this is a crockpot recipe. is there a way to do this without one? also, you could maybe cook cut up chicken pieces in a skillet with a bit of oil over medium heat, then pour the sauce over the chicken and simmer it for 10 minutes or so. if you do this, I would definitely add a bit of cornstarch to the sauce to thicken it up since you won’t have shredded chicken in the end product. YUM! This looks geat and I cannot wait to try it. Looks delish! I like to make crockpot meals on sundays so I can relax and hang with the kiddos so we will defintely be trying this. i think my husband would love this so much! I made this for dinner last night and it was great! I didn’t double the sauce and there was still plenty of sauce for three chicken breasts. One question though – one of my kids wondered if it could be thickened up a bit. Have you ever added any thickening agent? Did it mess with the taste? hi kristina! yes, you could easily thicken it up. whisk together some corn starch and cold water. when you have the chicken removed from the crock pot to shred and the sauce is still in the crock post, whisk in the cornstarch slurry a bit at a time. I would keep the crock pot on so it’s warm – or you may even want to pour the sauce into a saucepan and have it simmering when you add the cornstarch mixture. this should thicken it up without changing the flavor! I wouldn’t go too crazy adding a lot, you don’t want it to turn into a thick gravy, but it definitely would be delicious thickened up a bit. just add enough until it seems right! I made this, but my crock pot over cooked it – even on low. Great recipe, will try again, but will cook it for a shorter time. good to know! I know when jess cooked it was much shorter and on high…I haven’t tried it on low, so thanks for the feedback! Thanks for the motivation to be more organized!! Made this tonight for dinner, and my husband raved about it being the best chicken teriyaki he’s ever tasted! I cooked it on low for 8 hours. Shredded the chicken at 6 hours to let the juices soak the chicken completely. So delicious, and will definitely make again. Did you use frozen or refrigerated chicken breast when cooking on low for 8 hours? Is this 3 breast halves? Or 3 whole chicken breasts? I made this chicken this week. It was sooooo good. I think I have a really hot crockpot, so I only cooked my chicken (thawed out) on low for 4 hours. It turned out great, and my family loved it. I will definitely be making this again. so happy it was a great success – yay! I am so glad to have found your website. This was one of the best dinners I have made in a long time. Thanks! you’re welcome! and I’m so glad you found the site, too! “see” you around! I don’t see why it would not work with the drumsticks! if you try it, let me know how it goes, but I”m sure it would be great! Made this recipe for the first time and gluten free and it was delicious!! Def. will be making it again, this recipe is also a great one to freeze and heat (if there are ever any left overs). We served it over rice, I would like to cook more sauce next time and thicken it. Was very good I add some pineapple chuncks and stri fry veggies to it!!!! Thank you!!! those sounds like yummy additions! It may be because I’m sort of new to cooking but when you say “oil” do you mean Vegetable oil, or Olive oil? Sorry for the confusion.